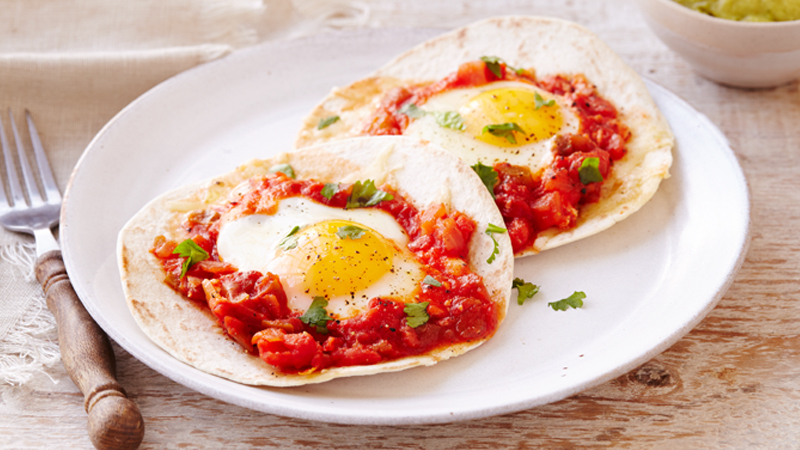 Ready in minutes, you can serve Spanish-style eggs any time of day. Heat the salsa in a large frying pan just until bubbling. Carefully break the eggs into the frying pan, leaving room in between each. Cover and simmer over a medium-low heat for 6-7 minutes or until the eggs are thoroughly cooked. Sprinkle each tortilla with cheese and top with an egg and salsa. Serve garnished with coriander. Stir chopped roasted pepper and sweetcorn into the salsa for extra body to the sauce. Give it a kick by adding some chopped red chilli or chilli flakes!